Airbag Module Crash Data Removal £30 Fixed Fee. We can remove Crash Data and Stored Faults. No need to go to the dealer. Save you hundreds of pounds and stress. Almost all makes of cars supported. If your car is not listed then please call to see if it can be done. Our technicians are able to repair locked airbag modules after the airbags have gone off potentially saving you hundreds of pounds for a fixed fee of £30 all in. In the past, if there was an issue with your airbag you had to get it replaced at a great cost to you. Your module will be sent back after repair and will work as if you had bought a new one. The module will work in exactly the same way as your original. If we can not reset your ECU the only cost to you is the postage back. The module will work in exactly the same way as your original one. All for one single payment of £30 special price. We cover the whole country. It's official, From January 2012 new regulations for M.O.T test stations require SRS(Airbag Lights), DPF and a few more management lights to be working in the correct fashion. If your SRS light comes on and stays on, this will be an M.O.T fail. If the SRS light does not come on at all then that is also a fail. Your airbag SRS light should come on and go of showing the car is doing the correct diagnostic tests ensuring the system is fully working. Insurance companies, Used Car dealerships, Main Dealers, Body shops, Auto electricians, Mechanics and the general public. 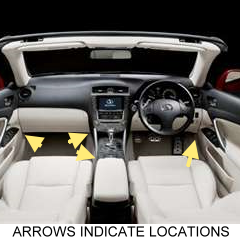 Remove Crash Data, Remove SRS light, Remove Fault Codes, Repair Module, Remove Airbag Warning Light. Please use the following to contact us or the contact us form.